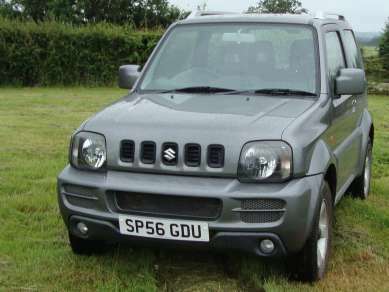 NOVEMBER 2006 56 REG SUZUKI JIMNY 1.3 JLX + PETROL 3 DOOR, METALIC GREY, 54,000 MILES, REMOTE CENTRAL LOCKING, RADIO/ Cd,E/W, E/M, AIR CON, FRONT FOGS, ALLOY WHEELS with 205/70R15 Tyres, ROOF RAILS, TOW BAR C/W SINGLE ELECTRICS. SERVICE HISTORY. MOT 24th NOVEMBER 2017.